The gorgeous Charity Anklet is a cute and feminine body jewellery 'must-have' for the summer. 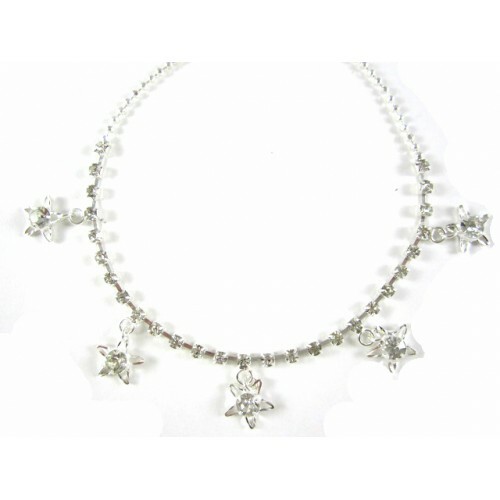 The silver, rhinestone encrusted chain with dazzling star charms can be worn on any occasion, fun or formal. Wear this to any event to draw attention to that sensational pedicure and toenail color. If you are unhappy with an item, simply send us an email at [email protected]bling.com.au within three days of delivery. Tell us which items you’d like in exchange so we can issue you with a Return Authorisation number. Simply write the RAN on your proof of purchase, enclose it with the item to be returned and post back item/s back to us within 7 days of receiving our RAN.